So many people or websites boast to have the recipe for the prefect meatball. What exactly is it that could earn a meatball the title of “The Perfect Meatball”? The quality of the meat? The meat to breadcrumb ratio? I guess technically it could be any one or all of those things. 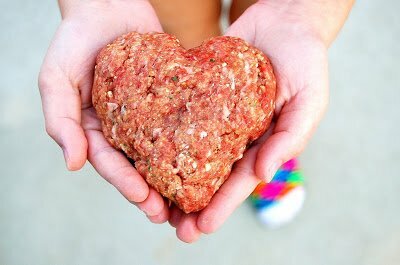 For me, I think any meatball that is made with love is the perfect meatball! Think about it…aren’t meatballs one of the first family meals you helped make as a kid? For many they were. I know my kids have been helping me make meatballs since they were about 2 1/2 years old. Now that they are 8 and 11, they take the lead and make them all on their own with just a tiny bit of supervision. The excitement, the eagerness, the passion and the love put into those balls of meat by my kids, never ceases to amaze me. When my daughter made the meatball you see above, in the shape of the heart and said “Mommy, look at my meatball, I made this one for you” I melted, and do you know what…It was the best darn meatball in the history of meatballs… because it was made for me with love! Here is how we make our meatballs, shaping them in a heart is entirely optional…wink! ** I have to share this with you…my daughter who is 8 doesn’t eat much meat…she never has, she has always said it hurts her throat. Since both my kids have a number of food allergies, some of them life-threatening, we listen to her body. When she first started making meatballs with meat from the supermarket, her hands, wrists and forearms would be dotted with hives…something a couple sprays of Benedryl would take care of. Once I began using meat from our farmers market, where the meat is ground right in front of me, she would have one hive or none at all. Out of curiosity, I “retested” that reaction a couple of months ago and bought ground beef from out grocery store and YUP, she was covered in hives…makes you think! Oil a baking sheet with a tsp of olive oil and preheat your oven to 350 degrees. Combine all of the above ingredients in a big bowl, gently toss it around with your hands until fully combined. Form into balls and bake for 20 minutes. Place the meatballs in your sauce and cook over medium heat for about 20 minutes, gently stirring every so often. Enjoy!! Wonder what they are putting in the ground beef to make her break out?! And yes, meatballs with love are the best.